The CBT3126 quadruple FET bus Switch features independent line switches. Each Switch is disabled when the associated Output Enable (OE) input is LOW. This is one package pinout of CBT3126,If you need more pinouts please download CBT3126's pdf datasheet. 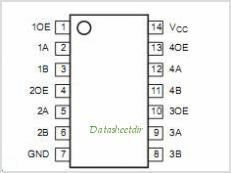 CBT3126 circuits will be updated soon..., now you can download the pdf datasheet to check the circuits!